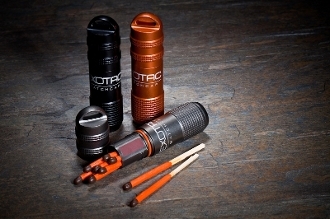 The MATCHCAP™ is a nearly indestructible waterproof match case for storing matches and other fire starting material. By integrating the red-phosphorus striker into the threaded are of the capsule, we created an innovative solution for having to pack separate match strikers. To ensure our match case was going to be the best out there, we added a concealed o-ring, durable square threads, a bottom strike-anywhere striker, and a high-end aesthetic to bring it all together. Do not overfill the MATCHCAP™. Leave approximately ¼ of the volume empty. When using the phosphorus striker on the top of the MATCHCAP™ it is advisable to strike from the top (opening) towards the O-ring. This will prevent any stray sparks from entering the inside of the MATCHCAP™.